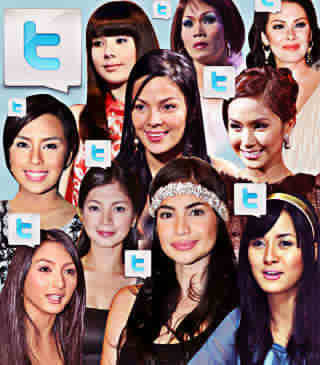 Celebrities are among the top reasons why a lot of Filipinos are hooked on Twitter. And to list down the top Philippine celebrities with the most number of followers, TechnoBaboy.com posted an entry with those who entered the Top 25 bracket. Topping the list is the Princess of All Media Ms. Anne Curtis (@annecurtissmith) with a whopping 1,614,402 followers as of this writing. Another primetime royalty falls on the second spot in the name of Ms. Angel Locsin (@143redangel). The young actress garnered almost a million followers (932,693 followers as of this writing). The Multimedia Queen Ms. Kris Aquino (@itsmekrisaquino) follows next with 843,663 followers to date. The ever-popular comedy icon Vice Ganda (@vicegandako) got the fourth spot for having 839,453 followers to date - too short to grab Kris's spot soon! Kapamilya hunk Sam Milby (@samuelmilby) closed the top five most followed Philippine celebrities with 780,451. Look at the list, only two Kapuso - Tim Yap and Maxene Magalona, and two Kapatid - Ruffa Gutierrez and Mo Twister, made it to the top 25 most followed celebrities on Twitter. The rest are all Kapamilyas (well, excluding Lea Salonga and Georgina Wilson who both have no network affiliations). This could also be the reason why most of the Kapamilya shows trends on Twitter than the ones from GMA and TV5.